Trinity College was founded by Henry VIII in 1546 by the merger of two existing colleges, Michaelhouse and King’s Hall, and seven hostels. Combined with lands confiscated from the Church, this made Trinity the richest and largest Cambridge College. Most of the college’s major buildings date from the 16th and 17th centuries. Thomas Nevile, who became Master of Trinity in 1593, rebuilt and re-designed much of the college including the enlargement and completion of Great Court, the largest court in any Oxford or Cambridge college. The court was built in Tudor Gothic style with a splendid central fountain and the clock tower, which is the oldest surviving building in the college, was relocated in line with the chapel. The clock strikes the hours twice, first with high note then a low note -or as William Wordsworth put it, 'a male and female voice.' Traditionally undergraduates try to run around the Great Court while the clock strikes twelve twice at noon on the day of the Matriculation Dinner. 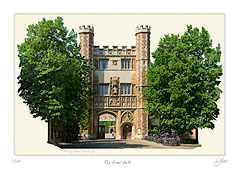 The Great Gate, built in 1530 as part of King's Hall, is the only college gate with two doors, one large and one small. Above the Great Gate is a statue of King Henry VIII. The original sceptre in his right hand was stolen and replaced with a chair leg in an undergraduate prank in the late 19th century! Below this statue are the coats of arms of Edward III and his sons.